I have no complaints about this item. It’s good entertainment for children and parties. Best bounce house ever!!!!!!! I love the fact that the slide is enclosed to keep the kids from falling off. The small ones with the slide in front are a little dangerous for toddlers. It is very durable holds about 5 toddlers at one time. A great play date item. My grand boys love it. They will stay in it for hours. Great purchase highly recommended. Surprised my children with this for my littlest birthday. Wow we’re they impressed!! 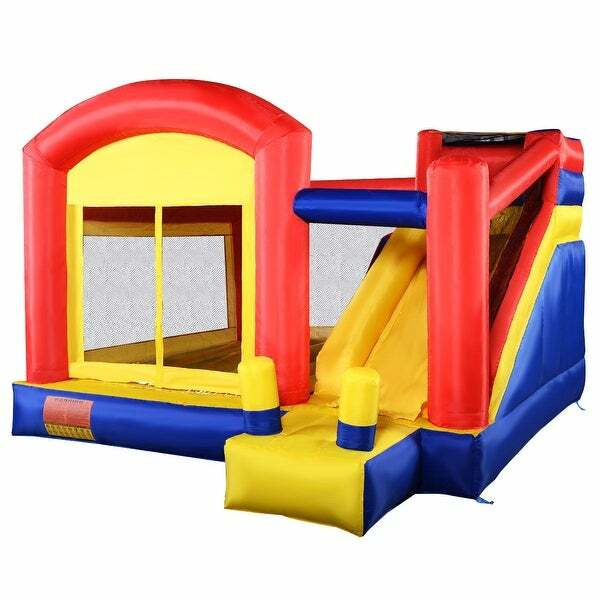 It’s the perfect size for a backyard friendly bounce house. Definitely recommend ! My granddaughter loves it. It was so easy to put up. Love it. Love it. The size is perfect, it fits perfectly on our yard space but the velcro on the entrance flap is so strong it has stuck to both of our kids hair to the point we almost had to cut their hair off. "would this be ok for 8 - 10 year olds?"